Q. No matter how many times I accept track changes in Word (or remove my header/footer), everything is still there when I upload to KDP. Do I have to retype the whole thing? What you have to do instead is click on “File,” and then “Info.” You’ll see the screen below. 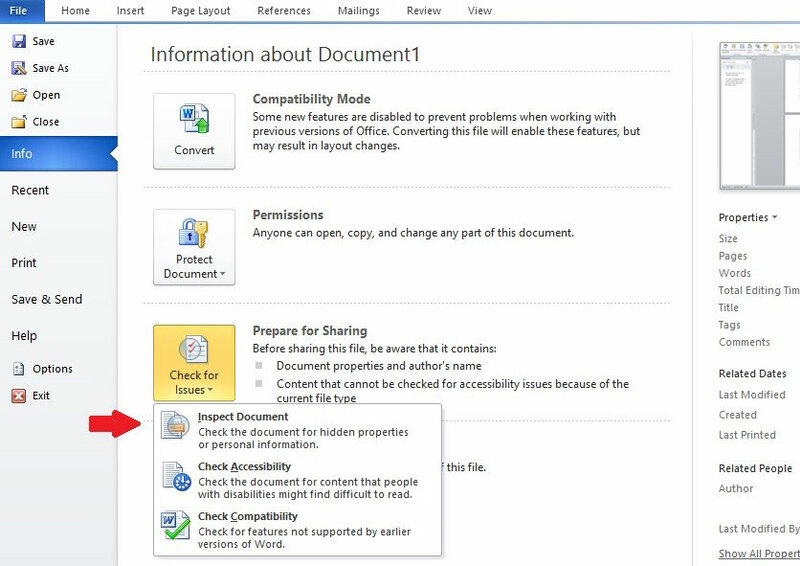 See where it says “Check for Issues?” Click that dropdown, and then click “Inspect Document” (red arrow below). You’ll be prompted to save your document, and then you’ll be presented with a list of things to check, including headers, footers, and editing comments. I check them all. After a quick scan, you’ll be presented with all issues found, and asked if you want to have them removed. I remove them all. Presto: markups, headers, and footers all gone. I was a little surprised at this next question. Well, not the question so much, but the answer. Q. My goal is to submit to Kindle Scout. They say to use the Chicago Manual of Style for my formatting, but the only version I can find online requires me to pay. Do I really have to use it? Ah … no. The Chicago Manual of Style very much covers formatting. In fact, the first three sections discuss parts of a book/journal, considerations for web-based publications, process outlines, manuscript preparation, and guidelines for authors, illustrations and tables, and more. 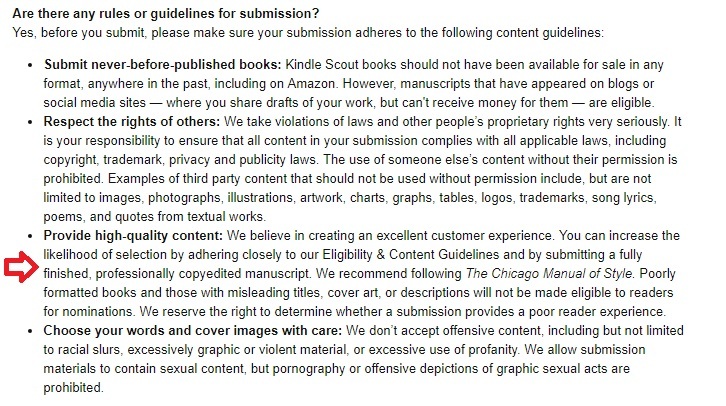 Think of it this way: Kindle Scout receives thousands of submissions. One easy way to whittle those down is to toss the ones that didn’t follow submission guidelines. You can read the full Kindle Scout guidelines here. The screenshot below discusses formatting: Used-but-current copies of the CMoS are available from Amazon for a reasonable price. Q. Why have all my reviews disappeared? My mom/neighbor/coworker posted a review, and it’s gone! 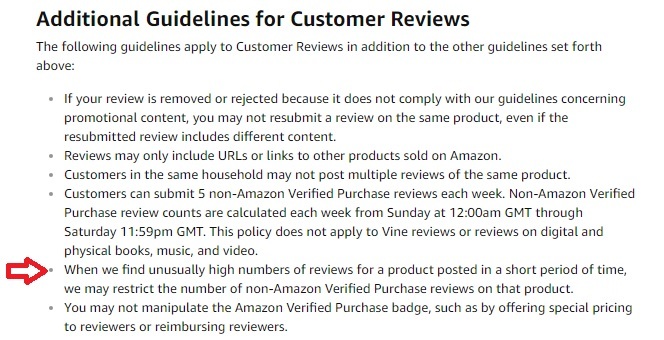 A. Amazon doesn’t allow reviews from people we know. Sometimes they think we know someone when we don’t, but if you know someone well enough for them to have emailed and told you they left a review, you know them well enough for Amazon to remove the review. A. I’ve seen a surprising number of people say, “Yes, of course! Authors love free publicity!” I’d tread carefully here. True, authors love free publicity, but most authors are fairly picky about where/when/how that publicity happens. I’d check with the author first to get permission. Listing another author’s work implies you have the endorsement of that author, but you might not. It’s safer to check first to be sure. There you have it, round two of everything you ever wanted to know about self-publishing. 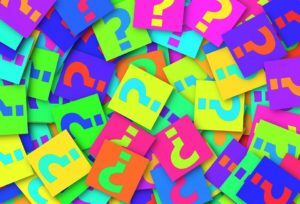 The next installment will come along as soon as I’ve seen the same bad answers often enough to shake my head and decide I need to do something about it. My guess is to insinuate a relationship with, or endorsement by, that particular author (it was a very well-known author they were discussing). But they couched it as free advertising for the author (as if that author needs it!). I’m amazed at how often I’ve seen questions like that come up. I’d think the authors they are using may have strong negative reservations about being seen as endorsing someone who may not be their equal. It could negatively affect them. It would not be just “more publicity”. Bottom line – get their permission or you could be in deep trouble. Yikes, that is truly frightening! I run into some strange, strange questions on some of those forums! It does not appear to be a do or die requirement, personally, I think you are right to use the smashwords formatting because it cleans out all the hidden document formatting. With regard to Word, I’m confused. I always make an html of my doc and view it in the Kindle Previewer before uploading to Amazon. I’ve never had a formatting problem with my eBooks. I decided to inspect one of my docs, as per your instructions. Two things came up: Custom XML Data; and Document Properties/Author. I don’t know what either implies! Since my eBooks download properly, should I leave well enough alone? Thanks for the helpful post, Melinda. Pinned & shared. Thank you for this highly informative post, Melinda. As an indie author, I thank god IU has people like you to save us hours and hours of frustration and research! My question is: would you recommend subscribing to CMOS online (with the most up-to-date-info) or do you prefer a “previously enjoyed” print version? I subscribed last year but for some reason found it difficult to obtain quick answers as I wrote. Previous Previous post: From the Mail Room: How Do I Know Which Book Promo Sites Are Legit?